This is the time of year when I seldom ride for fun. I commute occasionally, as weather and errands allow (I oftentimes have to run errands that require the use of a four-wheeled vehicle). I also try to ride each bike at least once a week just to keep it running. I don’t like to let my vehicles sit. One tip I’ve read is to either park your bike with a nearly empty tank and fuel stabilizer added, or better yet, park it with a full tank of fuel. When bikes sit for long periods, water condensation can form on the inside of the tank. If the tank is full, there is very little exposed surface area inside where condensation can form. That is why I choose to keep my tanks full when they are parked. I’m not a mechanical expert by any means, so if any of my knowledgeable readers want to pipe in and comment on the validity of this approach, I’d appreciate it. 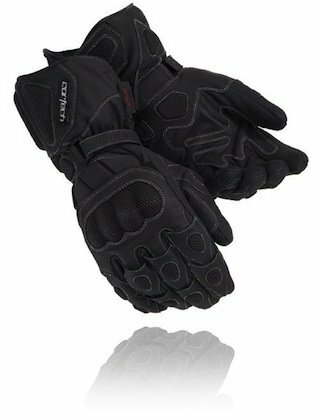 A few months back I purchased a pair of Cortech Scarab Winter Gloves from MotorcycleSuperstore.com for $78. I wanted a 1) leather 2) gauntlet-length 3) waterproof glove with 4) knuckle armor. I also didn’t want to spend more than $180 for the pair. After reading a LOT of product reviews, I chose the Scarabs. My short review is: they have met my expectations. I have worn them while riding my 2012 Suzuki GSX-R750, which has no hand guards or heated grips, in temperatures ranging from 70 degrees down to 40 F. I have worn them on my 2007 Suzuki V-Strom 650, which has hand guards but no heated grips, in temperatures from 55 degrees down to 40 F. The gloves are surprisingly warm, which is code for: it takes 45 minutes before my hands get cold instead of 15 minutes like most multi-season gloves. They are somewhat stiff when operating controls but after putting a few dozen hours in them I can tell they are breaking in and loosening up a bit. They are comfortable, easy to put on and take off, and don’t make my hands sweat (which is rare; I have sweaty hands). I’ve not tried to put the gauntlet under my jacket sleeves and I doubt it would work if I tried. These gloves are allegedly waterproof, but I’ve not yet ridden in anything other than occasional showers. Normally when it’s raining hard, you want your jacket sleeve to fit over the glove. The gauntlet on these is big enough that it’s not feasible to do so. If I were wearing these in anything more than moderate rain, I’d wear my Aerostich triple-digit rain covers over the top. My ultimate test of a product’s worthiness is value: does it’s features and quality exceed the cost? In the case of the Cortech Scarab Winter Gloves, I definitely feel they do. They are a good value in an armored, gauntlet-style waterproof glove. I have since worn the Scarab’s in colder temperatures, down to the upper 30’s, riding both my V-Strom with hand guards and my Gixxer (no hand guards). The gloves work reasonably well and I maintain adequate dexterity. I have used them with a pair of silk glove liners and find my hands are comfortable quite a bit longer before they get cold. So far I would say these gloves exceed my expectations. After a ride to Detroit and back on Saturday, the fantastic riding weather was too tempting to deny so on Sunday I headed out once again on the Gixxer. I fueled up in Estacada, then rode straight through to Detroit where I drank a Frappucino and ate a Snickers bar before heading back. I didn’t get gas in Detroit as I usually do, making the calculation that my bike would make the roundtrip on a single tank of gas (Gixxer’s don’t have a fuel gauge). Once I left Detroit, I caught up with a guy on a Yamaha FJR1300 that was loaded up for a long trip. He quickly waved me past and I zoomed forward. He followed me until the turn off to Timothy Lake, at which point I saw him do a U-turn in my mirrors. I think that was the way he wanted to go. Not much farther down the road I heard a “Whoosh!” and saw a guy on a black Yamaha R1 zoom past me. I quickly caught up with him and was soon riding up his tailpipe on the corners. He was riding fairly aggressively, going fast in the straights, but he had a disjointed style in the corners and wasn’t taking them very efficiently. Soon I passed him as well as numerous cars. Before I knew it I got to Ripplebrook Ranger Station and stopped under some shade in the parking lot. Less than a minute later he pulled in and parked next to me. We chatted for a couple of minutes before his buddy on a red and white anniversary edition R1 showed up. Finally their third buddy on an FZ1 pulled in and the four of us talked for about five minutes about bikes. They couldn’t say enough good things about my GSX-R750 and were blown away when I mentioned it apparently has a top speed of 180 mph, stock. The stock 1000 cc R1 can only go 6 mph faster than that. They were in somewhat of a hurry to get back into town so they pulled out and headed down the road. I put my gloves and helmet on and sought out to catch up to them. It didn’t take long before I was right behind them, on the hill down to the river crossing at Indian Henry Campground. Between there and the next bridge just before Three Lynx I passed the FZ1; he didn’t appear to be a very good rider. Soon after the red and white anniversary edition R1 waved me past. I was then up the tailpipe of the first guy on the black R1. Again, he wasn’t riding very smoothly, actually tucking down against his tank when going into corners. This is opposite of what should be done. I quickly went past him, too. They had a hard time keeping up. The three guys finally caught up with me at the construction stoplight just west of Promontory Park. They followed me the rest of the way into Estacada where I pulled into town to get gas and they continued on westward. It was a fantastic ride and I had a huge grin on my face when I got home. I’ve put over 600 miles on my Gixxer 750 since I bought it two weeks ago. During that time I’ve ridden my 2007 V-Strom 650 once; I commuted to work on it one day last week. When I bought the Gixxer I planned to ride both bikes for a year, at which point I would decide which bike I liked better and sell the other one. Obviously, these are very different bikes. They serve different purposes and are suited for completely different types of riding. Many will say that a V-Strom can carve up the twisties nearly as well as a sport bike. Wait, who says that? Oh yeah, I’ve said it. Many times. And it’s true, up to a point. Ultimately it all depends upon the skill of the rider. A good rider on a dual sport will do better than an unskilled rider on a sport bike, and not to brag, I have proven that to be true in my own experience (while riding my V-Strom). This past weekend I rode to Detroit and back with my buddy, Keith. He was on his 2006 Ninja 250 and I was on my 2012 GSX-R750. The weather was great, the road was in good shape, and most of the traffic was going the other direction so very little passing was required. It was a fantastic ride. I noticed that my cornering speed has been improving steadily as well as my comfort level with the bike. I can take the same corners faster and with greater ease than before. I’ve also noticed that I can take the same corners substantially faster than I can on my V-Strom. [I ride many of the same roads repeatedly for practice, so I’ve become familiar with every corner.] If my doppleganger was on my V-Strom trying to follow me as I rode my Gixxer, he would be lagging behind almost immediately. The difference is noticeable. When I got home from the 160 mile ride I also noticed that I felt very little pain or discomfort from the ride. Normally, by the time I get home on my V-Strom I can’t wait to get off the bike and give my body a rest. I’m getting used to the Gixxer’s riding position and am learning how to grip the tank and use my feet to remove weight from my wrists and hands. Sport bikes are still not designed for comfort, but this is far less uncomfortable than I anticipated. When I ride my V-Strom now, the brakes, suspension and acceleration feel mushy. The handlebars feel like they’re a yard apart and the whole thing feels really tall. By comparison, my Gixxer feels like a total hard body, a toned and fit athlete that is ready and capable to handle anything I throw at it. When it comes to which bike will be leaving my stable next year, I can see where this is going. The one test remaining is to take the Gixxer on a road trip. I’ve got saddlebags on order. Stay tuned. I just added a new steed to my stable. It’s a brand new 2012 Suzuki GSX-R750, and it’s a beauty. As you can imagine, riding it is quite a bit different than my V-Strom 650 (yes, I still have my venerable ‘Strom) both in handling and acceleration. The Gixxer gets up and goes like nobodies business, but only when I tell it to; it’s very well behaved otherwise. This bike was purchased from Lanphere’s Beaverton Motorcycles in Tigard, Oregon. I handled all the sales and arrangements over the phone with their salesman, Delaney. I originally was seeking a GSX-R600 but both Delaney and I felt the increased torque, especially in low- to mid-range RPMs of the 750, better suited my riding style. I’m not a red-line kind of rider and that’s where the 600’s prefer to live. I rode the bike home, took a break, then took it on a 30 minute jaunt on a nearby semi-twisty road. I’ll take it back out again tomorrow morning. This process of ride, rest, repeat is a 3x heat cycle that breaks in the new tires. A common misconception is that motorcycle tires need to be scuffed up to break them in. Actually, they need to be heated up through riding and then allowed to cool down to do so. Usually three times is the charm. Otherwise, ride them nice and gentle for about 100 miles and that covers it, too. The forward riding position is quite a bit different than the upright neutral position I’m used to on the V-Strom. I feel like a great deal more of my weight is on my hands, which is true. When riding at freeway speeds a lot of the oncoming rush of air against my chest helps alleviate some of that pressure on my hands. I also get a lot more bugs on my helmet’s face shield due to a lack of windscreen protection. But on the plus side, the bike is super smooth, very capable, and truly feels at home when cornering. The 750 is considered to be one of the finest all-around sport bikes ever made and I’m confident I made a good choice. I look forward to putting a lot of twisty miles on it.